Orders may now optionally be purchased through Square, the familiar payment processing service you’ve no doubt already used at small retail and food shops. Whereas they use counter-top iPad registers, LearningFEA.com uses an online storefront at their domain located here. 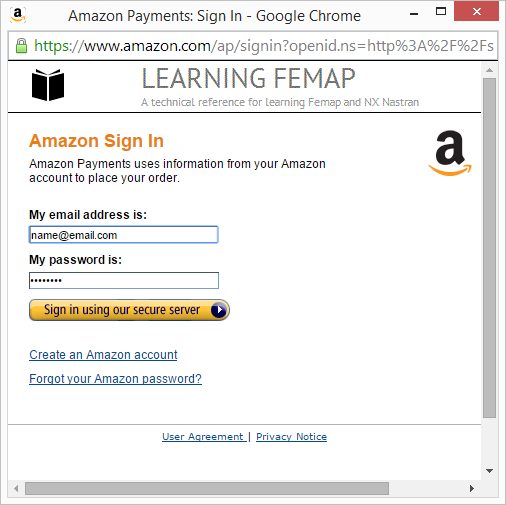 Like our normal Amazon payment system, your banking information is never seen or stored on the LearningFEA website. That link will take you to their secure processing portal. Reach out to us for any questions. The preferred system is still the one integrated on this website, however, some customers (like corporate accounts) may prefer not to have to pay via an Amazon account. Book purchases on this website are handled by Amazon Web Payments. This means you can use your normal Amazon.com account! Your banking information is not seen or held by this website. Amazon Web Payments offers a secure method for purchasing by using your current Amazon account. During checkout a pop-up will appear to complete the transaction using an SSL-enabled connection to Amazon. Again, your information is not linked to this website before, during, or after a purchase. For additional clarity, you can click here or on the picture to see the ordering steps. Click on the Amazon Payments badge below to learn more. Note: Use the contact form if your region is outside of the indicated areas! Orders sent to proxy shipping services will be canceled, so please do not arrange shipping through them. Thanks! Shipping is from the US and is not included in the base price. Domestic shipping is a flat rate of $4.49 via USPS Media Mail. Estimated shipping time is 2-9 days and tracking is available. Additional charges apply for international shipping, depend on the destination, and will use the USPS Priority International Flat Rate Envelope shipping category offered from the USPS by default. This is by far the most economical shipping method for international shipping. International shipping costs are between $24 (Canada) and $34 (Australia). Although USPS advertises 6-10 days for delivery, actual delivery time can take up to four weeks depending on the destination, but packages are generally received in one to two weeks. Packages passing through customs can cause delays for international shipments and widely vary by country. Use the contact page to request shipping costs and an estimate of shipping time to your specific country. Orders are guaranteed to be processed same-day during weekdays. Weekend orders are guaranteed to be processed and shipped the following Monday, but are generally placed in the mail same-day. *Updated 2015 – Shipping added for Spain, Switzerland, Norway, Sweden, Poland, Portugal, Netherlands, Germany, Cyprus, and Mexico. *Updated 2016 – Shipping added for Czech Republic, Singapore, Hungary. Note that Czech Republic is the ONLY country for which tracking cannot be provided. *Updated late 2016 – Shipping added for Argentia, Chile, Colombia, Peru, Venezuela, Ecuador, South Korea, Thailand, Israel, UAE, Finland, Indonesia, Greece, Belgium, South Africa, Ireland, Denmark, and New Zealand. Shipping regions are shown above. Use the contact form if your region is outside of the indicated areas. Learning Femap will be shipped to any country to which the USPS delivers. As mentioned before, US orders will arrive via USPS Media Mail. International orders will come via USPS Priority Mail International. Great care is taken when packaging the order to deliver sufficient protection from the shipping environment. For individual orders, each book is wrapped with a layer of corrugated cardboard to protect the edges of the book. The last layer of protection is a bubble-wrapped shipping package. If your order arrives with damage, please let us know. A replacement will be sent once the damaged product is returned. Learning Femap is sold and shipped from Virginia, USA. Virginia state tax code states that purchases made remotely (over the internet) are sourced to the seller’s place of business even if the goods are delivered to a purchaser in another location. A 6% sales tax is therefore assessed to each transaction with a VA-shipping address in accordance with state tax regulations. This tax rate is not applied to shipping costs. LearningFEA does not collect sales tax for out of state (or country) purchases. The purchaser has the obligation to pay use tax directly to the region where the property is used as long as the item is taxable. It is the purchaser’s responsibility to self-accrue and remit the use tax due on the purchase to their own locality if required.